STIGMA is a dirty word when it comes to people with disability. It paints them into a corner and sets them apart from the rest. In Morobe, they are trying to do something about it. At a recent workshop, the participants put their heads together to find a way that can help people with disability overcome the obstacles they face when trying to access services such as education, transport, banking, shops, and other public services and facilities. Kavieng General Hospital senior physiotherapist and Bulolo Disability association technical adviser Paul Na’au sees people living with disability in three groups – mild, moderate and severe disability. “Mild needs ninety to hundred percent attention; moderate uses assistive devices such as wheelchair, clutches, canes, walking stick, waterbed, hearing aids and glasses; and severe disabilities are bed-ridden,” Na’au said. The workshop helped design a draft disability development plan for Bulolo in line with the national disability policy. The second objective was to help form and maintain the disability organisation. The association was formed after several people with disability held several meetings in Bulolo to represent their interest. The executive officer and programme manager of PNG Assembly of Disabled People, Ross Tito, said disability was part of the district development plan but it took four years for the association to be fully recognised. “Disability is a cross-cutting issue. It cuts out across all aspects of life. PWDs are faced with inaccessibility, including opportunity and rights to education, family care and support, and empowerment. These are some of the common issues,” he said. A major obstacle is transportation. He said the workshop also highlighted the need to address issues like disability user-friendly buildings. “Stigma and discrimination is also affecting them,” he said. While the government has set up the policy to protect and aid people with diisability, much still needs to be done at provincial and local government levels for the policy to work. Currently, services such as education, transport, and economic opportunities are being provided by corporate organisations which feel that they have a responsibility towards supporting an inclusive programme for PWDs in society. The government from national level right down to councillors at the local level have made policies and plans of delivering services to all and it is up to the Department of Community Development, Women, Religion and Youth through its provincial divisions to ensure that these policies are implemented. The participants included PWDs, association executives, some of whom had some form of disability, caregivers, guardians, relatives, and representatives from the law and justice sector, health, community development, and education. Kimbing said trying to drive the national disability policy was often held back by the lack of logistical aid, finance, and manpower. The association is the only district disability group in the province and the second out of 89 in the country which has been registered with the Investment Promotion Authority. Members of the association are involved in sports, church, education and other community programmes. 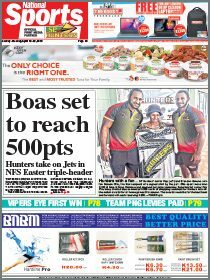 Six athletes – three men and three women – were presented with medals for their participation in provincial and PNG Games, even though they had no traner, no training schedule and no training facility when preparing. Athlete Makis Maiyo, who won silver in women’s para-power lifting at the PNG Games in 2014, said they had to meet their own travel costs to take part. Para-athletes also won medals in the men’s and women’s ambulant, blind javelin, shot-put, track events, and discus. 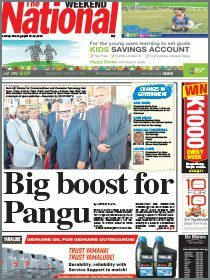 The athletes are looking forward to the PNG Games in Kimbe, West New Britain, this November. “There’s a way now, a barrier has broken. I have rights and can do anything like others do,” said Maiyo.